Remakes are an inevitable part of the Hollywood development process, but for fans of the original films, said remakes are often horrifying. But few respond as passionately as producer David Seger did when he found out that Robocop was about to be “updated” for modern audiences. Seger, who currently works as a commercial director after years of participating in the Los Angeles video community, assembled a team of 59 other collaborators for Our Robocop Remake, an unauthorized ode to the original 1987 film directed by Paul Verhoeven. Charging under the the banner of “If anyone is going to ruin Robocop, it’s going to be us,” the creators involved (including Cracked.com, Fatal Farms, Waverly Films, ScreenJunkies, JD Ryznar, Paul Bonanno, Team Tiger Awesome and The Indie Machines) each took a scene from the original film and remade it in their own way. When you watch Our Robocop Remake, you get to see 10 Alex Murphys, 12 Broddickers, 15 Lewises, and 30 Robocops. The players include cartoons, puppets, babies, street dancers, a Robocop cosplayer (who drove from Arizona to Los Angeles to film his scene) and guys dressed in the official Robocop Halloween costume. The violent climax becomes a trippy video remix. There’s an original musical number. There’s even some modern dance. Legally, ORR walks a fine line with regards to the rules about fair use and parody (especially as it does include original footage from the film and some copy-written music). But the endeavor is entirely not-for-profit: While the film screened several times over the last weekend in Los Angeles, and will be shown in New York on Wednesday, Feb. 5th, tickets are and were entirely free. And they’ve gotten away with it before: ORR is a follow up to Our Footloose Remake, an equally unauthorized 2010 remake of the Kevin Bacon dance classic made in response to the 2011 remake directed by Craig Brewer. According to Seger in a phone interview, the only legal blowback he and the OFR team experienced from that project was when the company behind the Footloose remake’s DVD release asked to interview them for a featurette about Footloose‘s cultural impact — only to be told, six weeks after being interviewed, that the company’s lawyers had forbidden their inclusion. “The legal department said they couldn’t show any of the footage or mention the remake at all,” he said. ORR (as well as OFR) was made possible in no small part thanks to Channel 101, the 11-year-old screening series founded by Rob Schrab and Dan Harmon (the latter of whom is the once-ousted-but-back-again creator of NBC’s (s CMCST) Community). Channel 101’s premise is simple: People submit five-minute episodes of shows, ten are screened each month, and five are voted back to continue the next month. Over its run, Channel 101 has featured comedians like Jack Black and Sarah Silverman, but more importantly created a community of people passionate about having fun making videos — many of whom were contributors to ORR. In fact, Seger did the numbers, and of the 60 scenes, 36 were made by currently active Channel 101 filmmakers, while seven were made by those who at one time had participated in Channel 101. Though the concept of Channel 101 alumni participating in ORR was awkward for Seger to explain: “Once you catch the bug, you’re still submitting shows if you’re interested in doing something like [ORR],” he said. 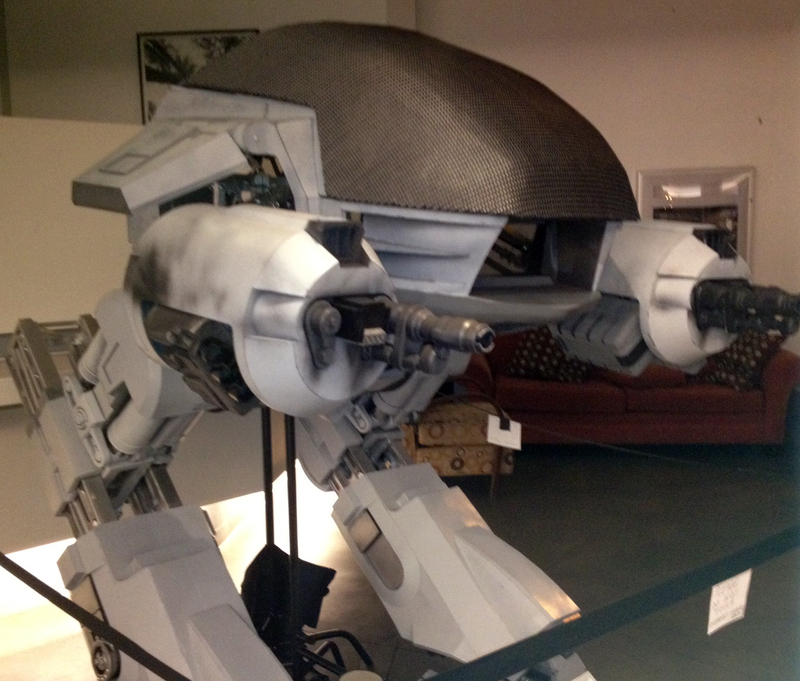 The ED-209 recreation used in one scene of “Our Robocop Remake,” built by Ghostlight, was on display at the Downtown Independent Theater in Los Angeles, which is also host to the monthly Channel 101 screenings. Seger has been submitting to Channel 101 for eight years, even before he moved to Los Angeles, and creating shows for the community also was a help to him professionally. “Almost every job I’ve gotten in L.A. has been through doing stuff for fun at Channel 101,” he said. This included working as Harmon’s assistant for the first two seasons of Community while also creating web content for the show, and Seger has continued to shoot behind-the-scenes and second-unit material. But on top of all that, plus producing ORR, he has an active Channel 101 series, Car-Jumper, going. It’s rated PG-13 (unlike the R-Rated original ROBO 1 and 2)…that’s why people are down on it. After watching the remake(funny how Asians get to see it first when it’s filled to the brim with social commentaries/satires meant for Americans), it’s a pretty good movie on its own. At first I was all nervous about watching it thanks to all the hate I felt from fans of the original but then I find out that the hate are out of place. Harmful even for other movies in the future. Seger is a gift to us all. Funny clip, but I don’t think anyone needs to ruin Robocop, I think Robocop 2 (& 3) did that for us just fine (just kidding robo 2/3 directors! ).